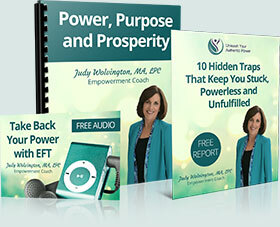 Are you frustrated that you’re not creating the fulfilling life of your dreams? Do you have amazing intentions, but things always seem to block you from achieving them? 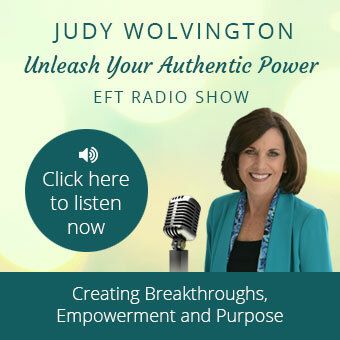 In this podcast I will present 4 steps that will help you get back on track so you CAN consciously create your life, your work and your relationships to be fulfilling, meaningful and prosperous. We’ll be using lots of EFT Tapping throughout to help you clear out negative energy and old patterns. We will take a look at the importance of Letting Go: letting go of our old stories, old resentments, and the things that make us cringe. Letting go of the Top 3 Negative Core Beliefs will help you rid yourself of some patterns that go clear back to childhood. None of them are true about you, yet you may have been living your life as though they were running the show. Then there’s Self-Sabotage. We’ll go into some of the top ways that we sabotage our relationships, our work, our finances and our lives in general. Isn’t it time right now to let go of things like perfectionism, procrastination, and holding on to guilt and shame? As you become a Conscious Creator of your life you will draw amazing people and situations into your life and will be able to bring your gifts out into the world. You will eliminate the fears and the blocks that have been keeping you small and invisible, powerless and without a voice.